Experience the most popular and most divine traditional Ayurvedic Rejuvenation Therapy; rest and calm your mind with Shirodhara as a gentle and slow, steady flow of warm oil, infused with organic herbs, stimulates the pituitary gland, inducing a deep state of rest and relaxation. 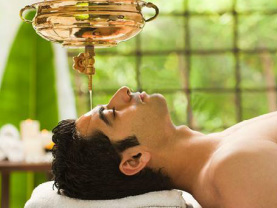 The name Shirodhara comes from the Sanskrit words ‘shiro’, meaning head, and ‘dhara’, the continuous flow of a liquid. Ayurveda considers the center of the forehead–or third eye–the seat of human consciousness, spirituality and healing. During Shirodhara, a state of pure silence and calmness is achieved, creating optimal flow of energy throughout the body, and a heightened internal awareness in the mind. As the gentle stream of warm herbal oil flows on the forehead, rhythmically moving over the third eye the therapeutic oils flow over the scalp and through the hair, transporting you into a blissful state of relaxation, triggering a self-healing response. The “third eye”, the anatomical point connected to the pineal, pituitary, and hypothalamus glands (responsible for hormonal secretions which regulate digestion, elimination, breathing, and our emotions) is soothed by the gentle and steady flow of the oil, allowing your body to release stress and restore balance. Clients who receive this therapy often feel as if they are floating in a sea of tranquility, where mind, body and spirit are purified while anxieties, fears, worries, exhaustion, sadness or anger wash away. The skin regains a natural glow and youthfulness with softened stress and worry lines. Sleep becomes deep and restful; hair recovers its luster and strength; and hormones are balanced by the stimulation to the pituitary and pineal glands of the endocrine system. You will emerge feeling blissful, with a heightened state of awareness and newfound sense of peace and happiness. •	Releases negative emotions and thought patterns. •	Improves mental focus and concentration.